Robert FILLINGHAM [Parents] was born about 1613 in , , England. He was christened on 6 Feb 1613 in Blyton, England. Robert married Annae. Annae was born about 1617 in , , England. Annae married Robert FILLINGHAM. M i Richard FILLINGHAM "I" was born in 1634/1639. He died in 1676. Maria FILLINGHAM was christened on 25 Oct 1645 in Willingham By Sow, Lincoln, England. BURNETT [Parents] was born about 1922. BURNETT married THOMPSON. THOMPSON was born about 1924. THOMPSON married BURNETT. GILBERT. GILBERT married MC BRIDE. MC BRIDE [Parents]. MC BRIDE married GILBERT. Dan Edward MC BRIDE [Parents] was born on 5 Apr 1950 in Brownwood, Brown, Texas. Dan married MYERS. MYERS. MYERS married Dan Edward MC BRIDE. W. Vernon WALDREP was born about 1908. He died about 1949 in , Brown, Texas. W. Vernon WALDREP married Emma Estelle BURNETT. 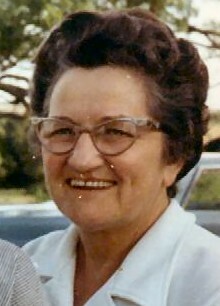 Emma Estelle BURNETT [Parents] was born on 19 Jun 1910 in May, Brown, Texas. She was christened in The Church of Christ. She died in Jul 1976 in Caldwell, Burleson, Texas. She was buried in 1976. Emma married W. Vernon WALDREP. Hary P. VAN WAGNER was born about 1870 in , , New York. He died on 24 Sep 1951 in Stone Mountain, DeKalb, Georgia. Hary married Sarah Isabelle STRICKLAND on 11 Sep 1896 in Atlanta, Fulton, Georgia. Sarah Isabelle STRICKLAND [Parents] was born on 29 Mar 1876 in Rome, Floyd, Georgia. She died on 21 Apr 1966 in Stone Mountain, DeKalb, Georgia. Sarah married Hary P. VAN WAGNER on 11 Sep 1896 in Atlanta, Fulton, Georgia. Dr. Samuel F. MATHERS [Parents] was born about 1838 in London, Madison, Ohio. Samuel married Josephine HAYES on 15 Oct 1863 in Wheeling, West Virginia. Josephine HAYES [Parents] was born on 3 Oct 1842 in West Granby, Hartford, Connecticut. Josephine married Dr. Samuel F. MATHERS on 15 Oct 1863 in Wheeling, West Virginia. Edward Hayes MATHERS was born on 18 Apr 1866 in , Ohio, West Virginia. Leonard MATHERS was born in Of, Columbus, Ohio. M i Dr. Samuel F. MATHERS was born about 1838. John H. EWING was born about 1841 in Wheeling, Marshall, West Virginia. John married Marion HAYES on 18 Oct 1866 in Wheeling, West Virginia. Marion HAYES [Parents] was born on 17 Jan 1845 in Granby, Hartford, Connecticut. Marion married John H. EWING on 18 Oct 1866 in Wheeling, West Virginia. Abraham BEDILION. Abraham married Margaret DEVER. Margaret DEVER. Margaret married Abraham BEDILION. F i Mary Elizabeth BEDILION was born on 20 Nov 1827. She died about 1853.